What’s The Best Tippet-to-Fly Knot? Question: Can you please, once and for all, answer this question: What is the best knot for attaching a fly to the tippet? 1. The kind of fly. 2. The thickness of the wire in the hook eye. 3. The diameter of the tippet material. 4. The kind of tippet material (mono, fluorocarbon, etc.). 5. The kind of action you want on the fly. So, for instance, a knot that works fine for a size 18 Adams — an unimproved clinch knot — may slip if you try to use it on a size 2 Muddler, which features much thicker wire at the eye. Many streamer aficionados prefer a loop knot, which allows the fly to move more naturally in the current (or so the theory goes). If you’re using super-thick mono as a bite guard for pike or tarpon, you need a specialized knot, such as a Homer Rhode loop, for that, as well. But let’s say we’re talking about the knot for an average dry fly or nymph. A quick survey of the literature reveals several knots that claim to be the best or are worthy of being called “100% knots.” (Theoretically, a 100% knot is actually stronger than the material from which it is tied, a concept that has never seemed plausible to me.) There’s the Davy knot, the nonslip mono loop, the sixteen-twenty-loop, and so on. Dig a little deeper, and you may find that there’s very little scientific data to support these claims; probably because scientists have better things to do than break tippet material all day. Part of the problem is that it’s almost impossible to recreate real fishing conditions in the laboratory. Fish don’t break tippets by pulling slowly in a single direction, and the tippet material in the tests probably hasn’t been soaked in water first. Throw in some slight abrasions or frequent stretching (as would occur when you’re fishing a streamer in heavy current), and who knows how that would affect test results? So I don’t put too much faith in the charts and graphs that spring up every so often to prove that an author’s creation is better than all that came before. However, there is one variable that you do control: how well you tie a given knot. And that’s really the key to the whole issue of knot strength. A knot that performs best in strength tests will still fail if you don’t tie it correctly. So when you are deciding which knots you’d like to use on-stream, take this into account. Some anglers may be able to breeze through the process of making a nonslip mono loop (Art Scheck’s favorite), while others may find it too difficult to tie it correctly in the wind or at dusk. 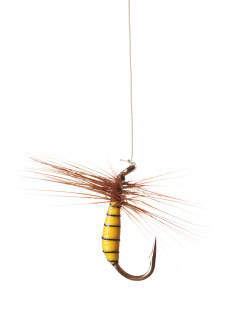 Here’s the confessional part of this column: I still use the improved clinch knot for dry flies and nymphs. I realize that it tests well below many other knots. But I’ve tied it thousands of times, in all kinds of conditions, so I have confidence that when I seat the wraps everything is where it should be. And — what do you know? — I don’t break off many fish. So your best bet is to do a little research, try tying several knots, and decide which ones work for your fingers. (You might want to choose one standard knot and one loop knot.) Then, the most important step is to practice tying them until you can do it perfectly every time. There is no magic bullet knot that allows you to skip this step. Remember: the best knot is a well-tied knot.